Trick-or-treaters, carving jack-o-lanterns, scary movies, and candy galore! These are just a few of our favorite things about All Hallows Eve. With Halloween just around the corner; kids getting their costumes in order and mad dashes to the store to stock up on candy, we wanted to share some fun facts about the sugar-filled holiday and offer some precautions to make sure everyone has a fantastically safe Halloween. Halloween originated from a mix of various cultures throughout time. Dating back 2,000 years ago during the Celtic time, the Celts believed that October 31st marked the end of warm and harvesting summer and the beginning of cold and dark winter. Their culture typically associated this time with human death and believed on this day ghosts walked the earth.They celebrated with Samhain, a Gaelic festival where people would wear costumes that resembled animals. The following day, November 1st, All Saints Day, was also celebrated and the previous day of celebrations was known as All Hallows Eve or Halloween. Halloween was brought to America through the colonization of New England by Irish immigrants, who made celebrating Halloween nationally popular by celebrating the harvest, sharing stories of the dead and lots of dancing and singing. Trick-or-treating as we know it today became very popular when Americans started to dress up in costume and go house to house requesting food and money. It has now turned into one of kids favorite nights of the year, where they try to collect as much candy as possible and negotiate how much candy they can eat before bedtime. With this spooky holiday, there always comes safety concerns for our little ones. Many communities and churches organize Trunk-or-Treating events where participants decorate their car trunks and friends and family come together to pass out candy by going trunk-to-trunk. 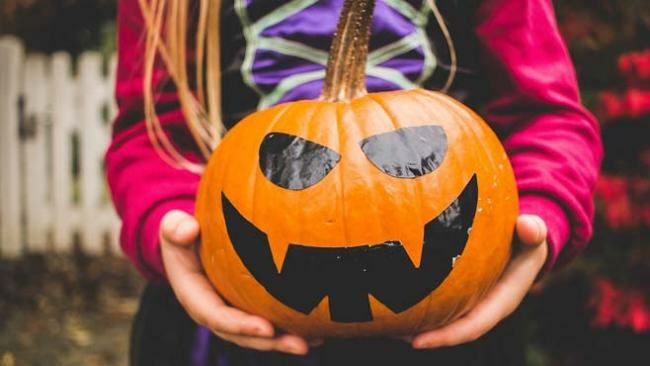 Kids love it because they can double-up on their candy routes, and it gives parents peace of mind knowing their kids are participating in a safe Halloween event. Trick-or-Treating and Halloween is a fun time of year but it important for parents to feel their kids are safely celebrating the Holiday. Here are some tips that parents can use to ensure there is no double, double toil and trouble for their family. 1. Make your game plan. Go over what routes or streets you will be doing while trick-or-treating with your kids before heading out.Try to stick to familiar areas, that way no one gets left behind. 2. Adult supervision is key. Children who are under the age of 12 should fill their baskets full of goodies with adults watching and near by. If they are more mature make sure they stick with a group of friends, so they can watch over each other. 3. Bring a flashlight or fun alternatives to light the way. You can be creative and make the light a part of their costume or candy basket, that way drivers or other fellow trick-or-treaters can see you and your witch or monster. Only stick to visiting houses that are well lit. 4. Wear Comfortable Shoes. The costume should help not hinder their trick-or-treating experience. Grab those comfortable shoes, there will be lots of walking ahead. Make sure costumes aren’t too long to eliminate any tripping. Also, avoid masks, which may make it harder for your children to see or breath. 5. Drive extra safely in neighborhoods. Little ones are distracted by the fun night and can walk, gallop or fly on their brooms, unpredictably. Drive slowly and cautiously. 6. Examine all candy when arriving home. Throw away any candy that is already open, old, or suspicious looking. Of course save a stash for yourself, you’ve earned it! Halloween is a real treat and Metromile wishes all families a hauntingly fun night. Don’t forget to stop in for a spell and get a quote with Metromile. If you are a low mileage driver you can save $500 per year on average with pay-per-mile insurance. Wishing everyone a fun and safe Halloween!